Schools across the Territory went head-to-head in the 2008 Engineers Australia NT Science & Engineering Challenge hosted by Charles Darwin University (CDU) at Casuarina and Alice Springs campuses recently. Students from 10 schools around Darwin took on a range of challenges to test their technical abilities, including the “Who Gets the Water?“ challenge to design a water control system to deliver water at a predetermined rate and location. For the “Mission to Mars” challenge, students designed a moon buggy with a suspension system that enabled them to haul a load across an undulating surface. High school students from Alice Springs and Tennant Creek also took up the challenge, with students from Our Lady of Sacred Hearts in Alice Springs winning the NT Title and the opportunity to represent the NT at the national challenge later this year. The school is now looking for sponsorship so the team can compete. This is the second year the challenge has been held in the NT due to partnerships with Engineering Australia NT, University of Newcastle, Rotary Club of Darwin North, Desert Knowledge CRC and the Department of Employment, Education and Training. 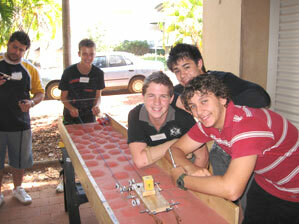 Enquiries regarding sponsorship support to help the NT Science & Engineering Challenge team travel to the Gold Coast for the national competition should be directed to Trisha Kohlweg, Secondary School Liaison CDU on 8946 6387 or email: trisha.kohlweg@cdu.edu.au.